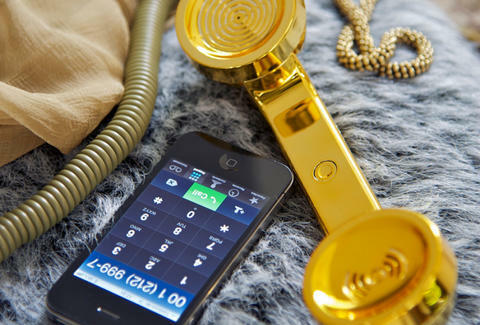 Just released by Goldfinger some dudes in Hong Kong, this ltd-edition, gold-plated classic home phone receiver actually plugs into any 3.5mm port -- including those on your male guardian's smart phone or laptop -- and then works like a normal phone thanks to a high-quality microphone and speaker box, which your dad'll no doubt love (below), especially considering he's a Big Boi. Andre 3000!! !